Merrillville, IN - On Sunday, October 11, 2009 the Circles of Serbian Sisters of St. George Church, Schererville, St. George Church, East Chicago, St. Elijah Church, Merrillville and St. Sava Church, Merrillville held 17th Humanitarian banquet “Mother Against Hunger”, at the St. Elijah Church Hall in Merrillville. Holy Liturgy was served in St. Elijah Church by local pastor Rev. Aleksandar Novakovich. Many sisters from neighboring parishes attended the liturgy. Banquet was at 1pm. Prior to the banquet St. Elijah Choir sang the Serbian National Anthem and the Lord’s prayer. After the blessing by the clergy the sisters from four Kolos served a delicious dinner. The specious Church Hall was packed. 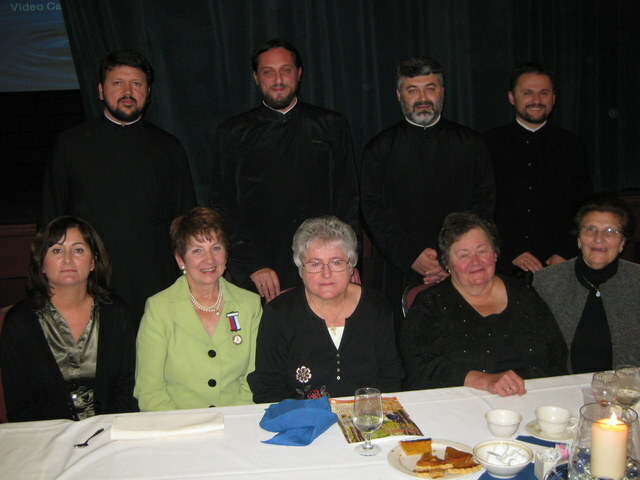 At the head table were seated the presidents of four Kolos: Slavka Manojlovich, St. Elijah in Merrillville, Mara Dobrijevich, St. George in Scherreville, Ljuba Radonjac, St. George in East Chicago and Milena Rudman, St. Sava in Merrillville, as well as Snezana Novakovich. Also the clergy from the four parishes were seated at the head table: V. Rev. Dobrivoje Milunovich, Rev. Aleksandar Novakovich, Rev. Marko Matich and Rev. Aleksandar Savich. Seated at the head table were also: V. Rev. Nedeljko Lunich, Dean of Chicago Deanery, V. Rev. Luka Lukich, pastor of St. Simeon in South Chicago and Mico Stojich, V. Pres. of St. Elijah Church Board. Fr. Aleksandar Novakovich, local pastor greeted all present and welcomed them to this noble event. He praised the Circles of Serbian Sisters for their love and dedication. The special greeting on behalf of His Grace Bishop Longin was delivered by V. Rev. Nedeljko Lunich, Dean of Chicago Deanery. The greeting is posted on this web site (see below). There was a special video presentation of the narration of the destructive war against Serbian lands and deliveries of the humanitarian aid to the Serbian orphans and refugees, prepared by Fr. Dobrivoje Milunovich and Snezana Novakovich. Fr. Dobrivoje and Snezana spoke about delivery in the Serbian Homeland. The Serbian Mothers Against Hunger has raised so far humanitarian aid in the amount of $464,238.00. May God bless our sisters and grant them good health and strength and increase their love that they may continue to help our brothers and sisters afflicted by our enemies. And our homes will soon replenish. Allow me to greet you today at this gathering on behalf of His Grace Bishop Longin, who couldn’t attend due to his commitment at a consecration of St. Sava Church in Boston, MA. I am honored to convey to you his message with the best wishes and a prayer to God for His Divine mercy and guidance. There is a lot to be said about the work of the Serbian sisters unified in the Ladies Auxiliaries throughout this Continent. Your hard labor and love for the Church had sustained church life in many parishes. The term sister is synonymous with the one of Serbian mother, which encompasses the highest Christian qualities. It is said in the Proverbs: “A woman that feareth the Lord shall be praised – and let her own works praise her” (Proverb 31, 30-31). “With the fruit of her hands she planted a vineyard. She stretcheth out her hand to the poor, she reacheth forth her hands to the needy” (Prov. 31, 16-20). The Serbian women organized in the Circles of Serbian Sisters performed glorious deeds. Throughout our church and national history, especially on this continent, our women played an important role in the preservation of our religious and cultural heritage. With wisdom and foresight they saw the need to expend their activities to an even greater level of assistance to our Church, and chose to accept as a main objective, the responsibility to help maintain a children summer program. Looking through the pages of your accomplishments one may rightfully say that you have succeeded to preserve our cultural and religious ideals, supported charitable and humanitarian institutions and gave every help when it was needed. Love and concern for our Serbian brothers and sisters, as well as sympathy for those who are suffering, have brought us today to this gathering that we may show compassion toward the victims of the last wars in the Serbian homeland. This is not the first time you have been giving of yourselves to help our Serbian people – the refugees, many of whom have lost everything: family members, houses, property. On several occasions through your efforts and generosity you have alleviated a lot of pain and suffering of our brothers and sisters in the Serbian homeland. You have followed a tradition of the finest sisterly care for our victims, for the needy and misfortunate ones. I have had opportunity to observe the diligent work of our sisters, especially where our children are concerned. Because of your individual and collective sacrifices and hard work for Serbianism and Orthodoxy over the years the good Lord has blessed your sisterly organizations with continued success. As we are commending you as a worthy members of these fine sisterly organizations, we must not loose sight of the fact that we should also honor you as good Christian mothers. We can not overlook the tremendous role you played in the fine upbringing of our young people. Let me tell to our young ones who have been called to fortify and strengthen the ranks of the sisterly organizations that your mothers and grandmothers laid down a firm foundation for the future generations to build upon. They gave you the proper tools and materials with which to perpetuate the ideals and goals that prompted them organize the federation of the Church Kolos. Their ideals were lofty and purposes benevolent. Because of their hard work and perseverance the Federation continued its work thus enabling the religious, cultural and humanitarian aims of the federation to be carried out. From the humble beginning the Federation has grown and flourished through the past sixty some years of devotion to our Holy Serbian Orthodox Church in all its endeavors. Dear sisters, we have entered a new era, new epoch as with God’s help the complete administrative unity of the Serbian Church on this continent have been achieved. Following the suit of the unity the Kolos of the former Midwestern and New Gracanica Metropolitanates have merged into one Federation of the Circles of the Serbian Sisters of the New Gracanica-Midwestern Diocese, with the Executive Board composed from both former federations. You were forerunners of this unity as you have been gathering for a worthy cause for more than a decade, approaching each other with respect and honor. We are sure you will continue to treat each other in the same fashion. Respect your spiritual leaders and help them in their very responsible tasks, as they are entrusted with your wellbeing and salvation, of course in God’s name. I am proud as a Dean of Chicago Deanery to see these young, remarkable and dedicated servants of God working together with you hand and hand, Father Dobrivoje, Father Marko, Father Aleksandar and Father Aco. Of course I would be remised if I would not mentioned the accomplishments of you former pastors, Fr. Lazar, who deservedly received award to wear the pectoral cross, Fr. John, Fr. Dragoljub. They did their best. I am sure their successors will enhance the work in administering the flock entrusted to their care. We congratulate the new Board of the Federation of the Serbian Sisters of the New Gracanica-Midwestern Diocese and pray that God watchsafe them and guide them in their work for the benefit of the Serbian Orthodox Church and Serbian people. To the pioneers and founding sisters of your Circles, who have passed on to a well earned rest, in the Holy Kingdom of our Lord, we say “Memory Eternal”. To those of you who are still backbone and moving force may the Lord and Your Holy Patroness bless you with a long life, health and happiness. Pod kojim ocajava tolike decenije? Od srpskog Pijemonta, samo patuljak osta. My people has despaired under, for a half century? While the sacred land of Kosovo, in hatred, is burning. To awaken people’s revolt, and calm down a national mourning…? Yes, we, together with a poet, lament over the destiny of our Serbian people and Serbian land. The new epics will be commemorating those tragic events, uplifting the spirit in a hope that Serbia will rise again. May God safeguard our Serbian people and all peace loving people in the world. May He, the Prince of Peace, grant peace to our people and deliver them from all enemies, from affliction, from pain and suffering.